How To Improve Your Online Brand | Brand On! Do you “own” the first page of results, or does your name barely show up? Are there negative references you’d rather not see? Fortunately, there are easy steps you can take to start building a better online profile for yourself, starting with your Google results. I’ve been using a great site called BrandYourself to boost my own Google ratings. This is a do-it-yourself platform that lets anyone improve his or her own search results. After signing up for a free account, the site will give you an initial grade on your Google rankings. Fortunately, I got a B+. That’s because I have spent years using social media sites and search engine optimization techniques to raise my online profile. I just had two minor pages I’m trying to remove. For many people, you might be starting with just one or two links about yourself (likely your LinkedIn or Facebook profiles if you have those), or even some negative results you want to “bury” or bump off of page one of Google. This is where the power of BrandYourself really kicks in. 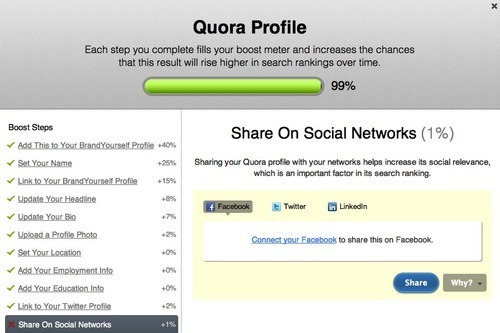 The site provides easy-to-follow steps on how to add links about yourself, then “boost” them. I found it very game-like and user friendly. 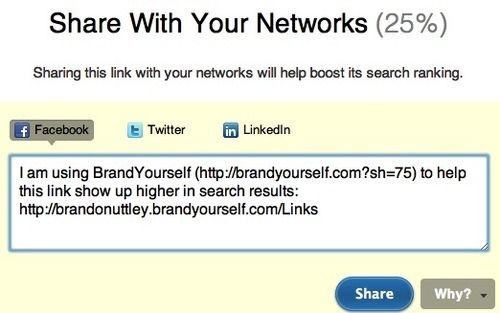 I’m using the free version of BrandYourself, which allows you to submit and boost up to three links. Their paid plans are very affordable, ranging from $9.99 for one month to $79.99 for a year. Be aware that the results are not instantaneous. It can take several weeks to see actual results on Google. Personally, I saw a “negative” result for me drop off after less than a week! BrandYourself admits that they can’t control Google results—no one really can—but the steps they recommend are all “white hat” techniques that are search engine approved. In fact, I’d say you’ll learn a lot about SEO just by using their site…including ways you can improve the results for your business.